A recessed lighting trim or bulb can change the appearance of your living room. If you are embarking on implementing a recessed lighting project, it is recommended that you research widely on how to space, types of lights, and the various ways they may improve your lighting. This article covers you as it highlights the vital information needed for using recessed lighting to improve your living room. We hope that this article will help you make an informed decision about why you need to recessed lighting in your living room, the various options you have, and what you need to consider. Recessed lighting is also referred to as downlights, or can light and is a light fixture is topically into a hollow opening in a ceiling. 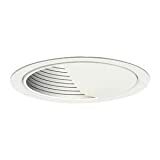 A recessed light is installed, it usually appears to have the light shine from a hole in the ceiling, and it concentrates light downwards as a narrow spotlight or a broad flood light. Therefore, the recessed lights are metal light housings that you can install just above the ceiling line. You should also note that no part of the light is visible. Before installing recessed lighting, you need an extensive ceiling wiring. The junction boxes allow for light-to-light connection, which implies that you are only running one cable and not several. The recessed lights vary in diameter from 3” to 6” on the consumer market. You should note that the housing is the light fixture, and it sits above the ceiling, holding the trim and the light bulb. You need to find the housing that perfectly suits your preferences and needs. The trim usually fits in the housing and extends to form the outer ring that you see when you look up at the ceiling. The major types of recessed lighting trims are discussed below. For remodel applications where the backside of the ceiling is not accessible. Housing installs through an opening in the ceiling from below. If you consider recessed lights, you need to pay attention to the size and type of bulb or lamp that the fixture uses. Some recessed lights usually work with screw-in bulbs, but others use pin-based bulbs. Importantly, you should know factors like wattage, lumens, and color temperature affect the quality of light in a room. LED and halogen bulbs are the most commonly used bulbs in recessed lighting. The LED lights aid in lowering energy costs and the bulbs are usually cool to the touch. Here, you need to look for warm color temperatures in the living rooms, which the light bulbs provide. 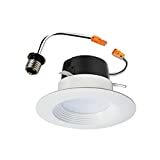 Even though recessed fixtures are usually installed between the joists of the ceiling in a new building or remodeling projects, some recessed lights are usually designed mainly for retrofit applications and can sometimes slip into an existing ceiling space via the holes made to accommodate the wiring. Importantly, the fixtures that you choose must be rated for their insulation (IC rating) whenever the ceiling insulation is present. When a ceiling is not insulated, a non-IC housing may be used. The recessed light fixtures are flush with the living room ceiling, which makes them great for rooms that have low ceilings. 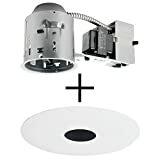 These fixtures usually have three main components that can be used in defining the type of recessed light – bulb or lamp type, trim style, and housing. Line-voltage kits are standard light kits and typically run on household current. 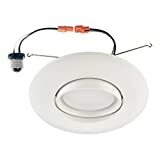 The Recessed lights are typically available in sizes that range from 3 to 6” in diameter. Choosing the size is dependent in the planned function as well as the location of the light. However, you should note that small recessed lights usually fit well with modern décor styles. They are best for highlighting areas and work as task or accent lighting. Larger lights are vital for room lighting. However, you should take into consideration of the ceiling height as a higher ceiling casts light wider but more diffuse. You can also change the trim to different styles or finishes at any time without changing the housing. 6” trims come in more varieties but 3” and 4” trims are also available in other finishes. First, you should have a sketch of where the recessed lights should go. Second, you should decide if you want to choose a focal point, such as a particular spot that needs recessed lighting. Third, you should follow the ceiling line and distribute evenly in the ceiling. Fourth, you should avoid shadows in the corners by placing the lights about 3” away from the wall. You should refer to the instruction manual provided by the manufacturer. It has a step-by-step guide and instructions and safety information about installing recessed lights. However, if you are in doubt, you should consult with a licensed electrician. Recessed lighting is best for your living room mainly because it allows for even distribution of light unlike using lighting fixtures that hang below the ceiling line. Instead of using multiple bulbs that emerge from the ceiling, using recessed lights will allow you to eliminate the need of single bulbs. Recessed lights is a great source of illumination to your living room and follow a minimalistic approach that allows you to avoid clutter especially for low ceilings because they do not protrude below the ceiling line. Besides, you can control the light better compared to traditional ceiling lights. The bottom line is that using many of the traditional ceiling lights sees to clutter your living room, and recessed lights can help you sort this out. It Makes Your Living Room Appear Bigger. Recessed lighting entails using light fixtures that do not hand below the ceiling line. You should note that light fixtures that hang below the ceiling line obstruct the natural line of the ceiling. To your eyes, this makes your living room appear smaller and broken up. Even though recessed lighting does not add more square footage to your living room, it seamlessly blends into the ceiling line. Consequently. This makes your living room appear bigger and more spacious. Everyone wants to associate their living room to these attributes, and these are achieved by installing recessed lighting. Recessed Lights Make Your Living Room A Lot Brighter. You need to install one or two traditional lighting fixtures so that you can brighten up your living room. The traditional lighting fixtures focus the light in one area and scatter out the rest of the light in the entire living room. The problem with this is that you end up with shadows in your living room. 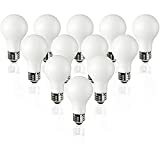 Besides, the lighting is not bright enough in some areas since the traditional lighting fixtures scatter the light unevenly, which makes some areas bright and others dim. This is not the best design for a living room. It would look strange to use more than two traditional light fixtures. However, with recessed lighting, you can create a lighting layout that will effectively and equally cover your entire living room without looking overdone or odd. 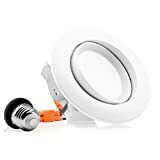 This will make the lighting distribution equal, and you will not find shadows or dim areas, which makes recessed lighting a preferable option to traditional lighting fixtures. In addition, the entire room is equally bathed with warm lighting, and this helps you create a lively and a well-lit living room that is also soothing and subtle. Once you install recessed lighting, you update your home. Even though this type of lighting is not a new trend, it still makes your living room look and feel more current. Many traditional lighting styles that entail the use of fixtures, and sit below the ceiling line are outdated, which is a big turn off to potential buyers. Buyers want to feel hat their living room is modern and that it is move-in ready and not a project that will need major renovations once they move into their new house to bring it up to date. Therefore, installing recessed lighting will give real estate developer and agents a competitive edge if they use recessed lighting in comparison to those who use traditional lighting fixtures that hang below the ceiling line. Therefore, it is paramount that you realize that recessed lighting provides a modern yet more classic look that is not going anywhere soon. You should note that your living room is a popular place to seat your guests, entertain people, or use it for relaxation. Whether you are chatting with your friends, watching movies, or just listening to music in your living room, it is vital to have a mix of light sources in your living room to adapt to whatever occasion you may be having. Just like in your bedroom, it is important to avoid bright, blue-light emitting lamps that are associated with the creation of serotonin and give us energy. Recessed lighting allows you to install LED lights. Your living room can take advantage of the recessed lighting which enjoys the LED BR bulbs or even recessed retrofit kits. 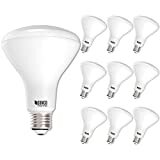 Besides, using the LED lights has lower energy costs, and the bulbs are cool to the touch, so you need not worry about increased living room temperatures. The recessed lights have an ability to recess above the ceiling. The light is adequate for all uses and can be changed according to your preferences. In addition, you can also tilt them or block light towards a certain direction, which means you can illuminate wall portraits. This allows for a better view. Recessed lights are more effective and provide a more modern look compared to traditional ceiling lights. They make your living room appear bigger and brighter. By installing recessed lighting, you instantly update your home, and you have options of selecting either trims or bulbs depending on your preferences. Recessed lighting allows you to Install LED Lighting for various occasions and provides adequate illumination that can be directed to focal points. However, before installing them, careful planning is needed, including how to space them. We hope that these 5 ways of installing recessed lighting to improve your living room highlighted in this article can help you design an optimize the preferences of your house. Hey Buddy!, I found this information for you: "5 Ways Installing Recessed Lighting Can Improve Your Living Room". Here is the website link: https://www.explodedhome.com/installing-recessed-lighting/. Thank you.